Get the flexibility of yoga, the confidence and balance of rock climbing with the serenity of running on mountain trails. Learn how to move from your core to keep your footing on life. The Healing Round is where the novice starts, the apprentice recovers and the master smiles. There are 76 animated transitions that join 17 positions together like a string of pearls. And like a pearl necklace, you can put your finger on all 146 movements of the hips and feet without getting overwhelmed. 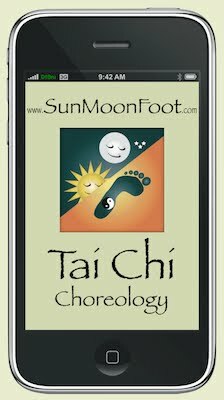 Sun Moon Foot is designed to help you establish a new pattern for movement in your brain. Tai Chi is designed to sharpen your awareness by developing new connections between your mind, body and the rest of the world. Marshal your awareness with martial movements to cultivate a mastery of stillness in motion. Tai Chi is a convenient way to exercise the plasticity of mind and body everyday. Restart your quest to perceive all and be distracted by none. Recharge and rejuvenate by learning a new way, again.